Former Maclean Music Academy students Madeleine Short, Troy Castle, Michelle Ryan, Connor Willmore and Emma Short, got together recently for a photo shoot and to discuss their upcoming Classical music concerts in July. Image: Peter Forrester. Five former lower Clarence singers reunited in Maclean during the holiday period, to discuss their upcoming concerts. 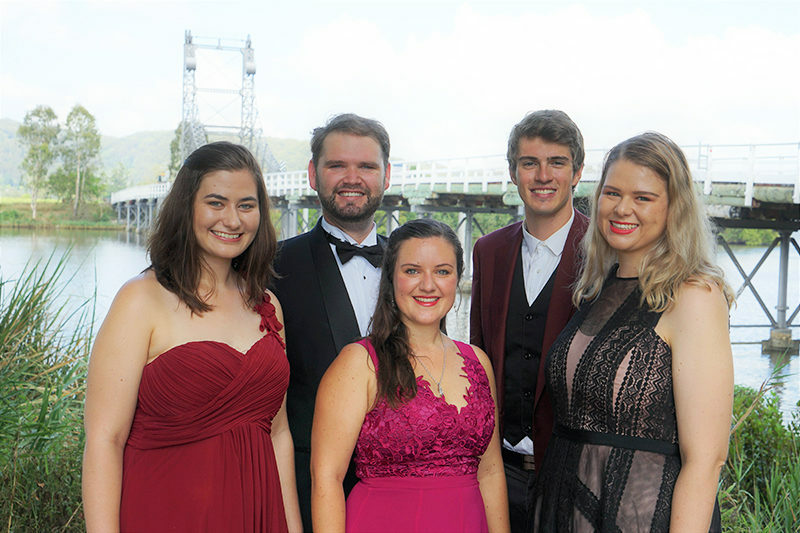 Former Maclean Music Academy students Michelle Ryan, Troy Castle, Emma and Madeleine Short and Connor Willmore will be performing their classical music concerts in both Yamba and Maclean during the July school holidays. All five talented performers studied music at the Maclean Music Academy under the guidance of their accomplished teachers Sr. Anne Gallagher, Gwen Berman and Connie De Dassel. Michelle Ryan, who currently lives in Sydney, said that she left the Clarence Valley in 2010 to pursue her singing studies in Sydney. “After I finished my studies, I held my very first Opera concert in 2014 –before leaving for Europe the following year,” Michelle said. “Troy Castle was also a part of this first concert. “Troy, Emma and Madeleine have all been undertaking their tertiary studies at the School of Music at the University of Queensland. 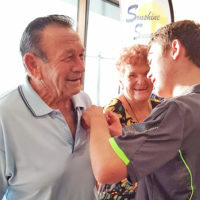 “Connor Willmore, who has been very (musically) active within the Clarence Valley community, will be starting his first year of studies this year, at the same school (as the others) in Brisbane,” she said. Michelle said that the group all feel that they have received a very special music foundation at the Maclean Music Academy. “As students of the academy we were given many opportunities; singing in community concerts, playing an instrument in the community ensemble for some of those concerts, singing in the community choir, performing in musicals, sitting the Australian Music Examinations Board (AMEB) examinations competing in eisteddfods and singing at Carols by Candlelight,” she said. “Overall, we were able to experience the real joy that music brings as well as being able to share it, with the community. Michelle said that through Sr. Anne Gallagher, Gwen Berman and Connie De Dassel’s dedication to (both) music and the community, it has inspired the singers to continue bringing concerts to the community, in between their studies and performing around Australia.